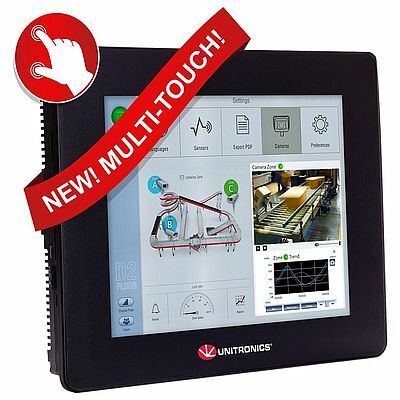 Unitronics released the newest member of the UniStream™ series, a multi-purpose PLC with an elegant, 10.4” multi-touch HMI screen. Multi-touch is a method of input on a touch screen that allows two or more fingers to be used on the screen at the same time. The elegant screen enables new gestures that are familiar to us all from the cell phones and tablets world — Pinch & Stretch on the screen to control zooming, Two-Hand gestures for increased operating safety, Press & Hold, Double-Tap, 'Swipe' and more—now you can use these to boost your client’s user experience. As a member of the UniStream™ series developed by Unitronics, this new multi-touch screen model offers the rich features of the UniStream line: auto-tuned PID, datalogging, data tables and Recipes, data sampling displayed via built-in Trends and Gauges, Alarms, multi-level passwords, multi-language support including Asian languages, communications with any device via CANopen, CAN Layer2, MODBUS, EtherNet/IP, and more. UniStream also supports Industry 4.0/cloud technology via its advanced communication features, including SNMP, SQL, VNC, FTP, SMS, email, and communications via GSM/GPRS modem and the ability to access your application locally via HMI program, or remotely via Web browser. UniStream™ controllers are programmed in UniLogic™, the All-in-One software that slashes setup and programming time. The built-in Design and Re-Use paradigm enables you to build Ladder and C functions, design HMI screens, create Web pages in multiple languages and save it all in a Library to reuse in other projects. Another benefit to the bottom line for the OEM and system integrator is Unitronics standard policy of customer care — no hidden costs, no paywalls or tiers. All software, utilities, and support — including membership in Unitronics’ Community Forum — are provided at no additional charge.